San Antonio League of Scouting Alumni – SALSA – is here to help former scouts of all ranks, their dads and moms, other family, and friends reconnect to Scouting in San Antonio. There is a place for everyone who cares about Scouting to continue that connection after the active Scouting years are over. 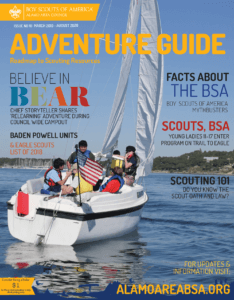 SALSA membership is easy, only $35 to become a Pathfinder, and it connects alumni to the news, events, and opportunities to join in the fun and help Scouting stay strong in the Alamo Area Council. Membership is growing and you can join today simply by clicking the link below. Other ideas in the works include attending an open shoot at the National Shooting Sports Complex, Eagle to Eagle Mentoring, a new Eagle Scout gathering, and a recognition reception sponsored by Ford Motor Company. For a full list of events and all the details including registration, please visit our website. Be sure to note these events on your calendar. To join SALSA and bring your enthusiasm and support to our growing Scouting Alumni, see the information available on our web site. Your excitement and desire to serve others while having fun is appreciated. Remember: Once a Scout, always a Scout.